A Must See Home! Town of Herndon Historic Structure No. 5 Built in 1917. Lovely Historic home near Old Town Herndon. Like New Inside/Solidly Built Construction. 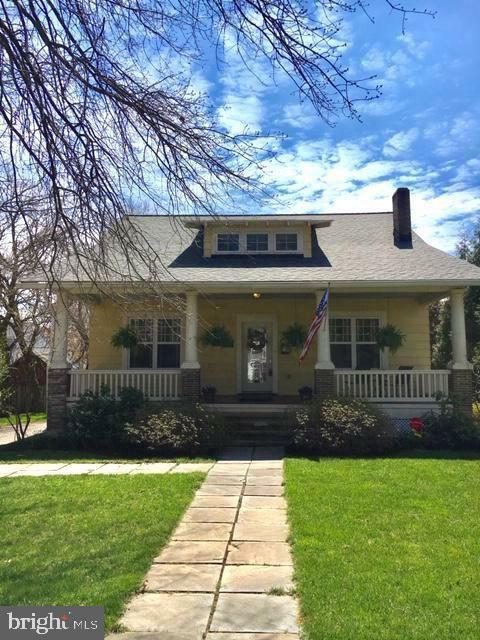 This Historic home has been completely renovated and has a Main Floor Master Bedroom. Home Warranty Offered. Kitchen has granite counters, 42" maple cabinets, with custom display cabinets, roll-out shelving, plus "lazy Susans", Stainless Steel GE Profile appliances, double wall ovens, hardwood floors & recessed lighting. Living Room & Dining Room have original hardwood floors, 9 ft ceilings, Crown Molding, Recessed Lighting and Overhead Light Fixtures. Family Room is situated off the Kitchen. Main Level Master Bedroom offers His and Hers walk-in closets & Crown Molding. Luxury Master Bath features Dual Granite-topped Vanities, Jetted Soaking Tub, Double Shower and Ceramic tile. Half Bath on Main Level. Upper Level has 3 Bedrooms- All with Walk-in Closets, Generous Storage & 2 Baths with Granite-topped Vanities & Ceramic tile. Windows have been replaced, Dual-zoned Trane HVAC system in 2014, with UV filtration light, New Roof installed in 2015, Deck and Fence added in 2010, New Cooktop 2019, New Dishwasher in 2016, Outdoor Shed installed in 2016, Fireplace converted to Gas in 2010, Wood blinds. A short walk to the bus stop with express service to Restons Silver Line Metro. Schools nearby. Enjoy Herndons community events from the comfort of your own front porch, including fireworks display and the Herndon Hometown Parade. Walk to Old Town Herndon, with diverse shopping & dining opportunities, plus the Farmers Market, Friday Night Live Summer Concert Series and more. A Truly Exceptional Home! Being sold "AS-IS" with Home Warranty. Directions: Old Town Herndon on Elden between Peachtree and Spruce. Look for Signs.